LACREON Technology Locks in a moisture-rich ingredient that keeps your lenses comfortable all day. Easy To Put In A subtle “123” mark lets you know when the lenses are inside out. Ideal For Busy Lifestyles No need to clean and store - wear them once then throw them away. UV Protection Protect your eyes from potentially harmful rays. 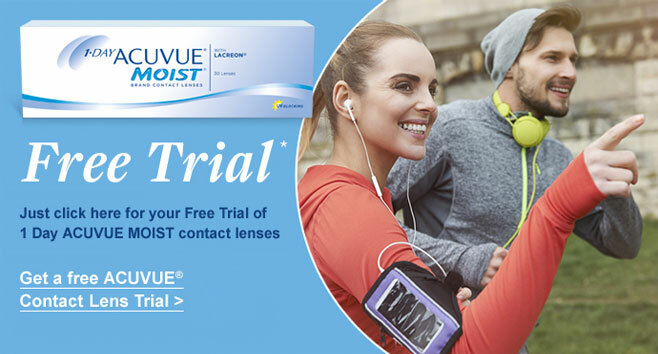 1 Day ACUVUE MOIST daily disposables offer a premium level of comfort and hydration, with many wearers claiming they don't feel like they're wearing lenses at all. ACUVUE's patented Lacreon technology is designed to help those who suffer from dry eyes when wearing other types of lenses. The unique design helps to lock in moisture, keeping your eyes moist throughout the day. Additionally, the built-in UV protection helps to ensure your eyes are kept safe from the sun's harmful rays. There's no special cleaning or storage necessary, making these lenses the perfect choice for those with busy lifestyles. Just dispose of your lenses once you're finished with them; it couldn't be simpler! By Richard on 01 February 2019 Ordered one day, delivered the next, so am very please with the service. By Patricia on 31 January 2019 Very easy to use and if only used for a short time, they can be put in lens fluid and used again. By Jacqueline on 30 January 2019 Very comfortable to wear. By Christopher H. on 15 January 2019 Very comfortable lenses recommended by my optometrist. By Marissa on 15 December 2018 Work very very well, the best acuvue contacts by far. By Ken Liverpool on 05 July 2018 I don't wear lenses all the time. Mostly I use them for playing snooker and my optician suggested these. They do the job and are comfortable to wear. Sometimes I forget they're in! By Tracy on 08 June 2018 I have worn these for years and still find them the most comfortable lenses when wearing for a long time. By Fatima on 03 May 2018 Good lenses. Never had any complaints. Just need to make sure you put them the right way in especially if you are new to lense wearing. Otherwise you’ll feel a little discomfort. But you will be able to tell by looking at the shape of a lense on your finger which was is the right way. Get optician to show you to be sure. By Carine Willemse on 27 February 2018 I have experimented with a few other brands, but I always return to 1 Day Acuvue Moist. It is the most comfortable lense to wear on a daily basis. I sometimes wear mine from 7am to 11pm without a problem, but it depends on a few factors. Overall, I wouldn’t even consider any other brand. By Julienne on 13 February 2018 lenses are light and easy to use. Do not dry my eyes. By MStopp on 23 January 2018 Sometimes they dry out quickly and don’t last the whole day. It is not a constituent issue. I thought it was my eyes, by my doctor told me it was the product. By Miss Heidi Lucas on 17 August 2017 Very comfy, I can happily wear these for 12 hours plus. By zetroy on 17 June 2017 Very comfortable lenses, I've been using them for a while now, and I have never had any problems with them. By Clare Thornley on 02 June 2017 This is the only lens my left eye can tolerate and I've tried many. I use a multifocal lens in my right eye so I have reasonable distance and close vision. Thank goodness for Acuvue Moist! By Kris Li on 16 April 2017 Been wearing them for years. Sometimes it's not easy to tear the individual lens case off the pack. By EVA on 05 July 2016 Been buying them for over two years now and have never had any problems or any bad experiences with them! They are great! By Christine on 30 June 2016 Very comfortable & easy to wear! By Timothy on 08 March 2016 I think they're good. I don't wear them my son does. By Charlotte on 27 February 2016 I have sensitive eyes and have no problem with these. By Omair on 11 February 2016 Suits me perfectly, been using it for more than 6 years. Comfortable on the eye! By Jeremy on 22 December 2015 ACUVUE seem to be the only brand that suit my eyes and the MOIST make that even more comfortable! By Lynn on 07 November 2015 Lenses are fine and very comfortable. By Stacey on 13 October 2015 I have been using this for years and it works wonders! Even better than tru-eye and other products in my opinion. It prevents eyes from getting dry! By Gordon on 22 September 2015 I have used these sense for several years. They are just what I want so happy with them. No issues. By Helen on 26 August 2015 Always great quality, therefore less waste. I have used Acuvue for many, many years. There are cheaper alternatives but you'll end up using more. By Esther on 22 August 2015 Have used this product for years! Very comfortable lenses! Thank you Lenstore for a superb service! By Hannah on 12 August 2015 Love these. They are comfortable and easy to wear. By Jill on 06 August 2015 Can't fault Lenstore. Fast,efficient service with next day delivery.